Be the first to share your favorite memory, photo or story of Elyse . This memorial page is dedicated for family, friends and future generations to celebrate the life of their loved one. 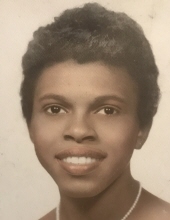 Elyse Loretta Wall, age 74 passed away on Thursday, March 14th, 2019 in Morristown NJ. Elyse was born on April 19th, 1944, the daughter of David and Evelyn Wall, in Morristown, New Jersey. Elyse graduated from Morristown High School in 1962. While there, she earned 11 awards for her many accomplishments in sports. She went on to attend Morris County College and earned a certification from Kathleen Gibbs Computer School. As a contractor, she provided many years of service to the Exxon Corporation, in Madison NJ. In her youth, Elyse had a passion for playing tennis and enjoyed racing her Dodge Challenger for sport! In her later years she was content with watching professional tennis matches on television and listening to music. One of her favorite pastimes was spending time at Flea Markets and Thrift Stores, shopping for treasures. Elyse had an outgoing personality, optimistic perspective, boisterous laugh and very loud whisper! She was a devout Jehovah’s Witness who never missed an opportunity to share God’s word with others. Elyse leaves her loving memories to be cherished by Robert Wall of Orange NJ, Bernice Wall of Morristown NJ, Gilbert Wall of East Orange NJ, Elizabeth Mincey of Morristown NJ, Edward Wall of Mine Hill NJ, and Bradley Wall of Miami FL, along with a host of Nieces and Nephews. She is predeceased by brothers Freddy Wall, David Wall, and Willie Wall, and sisters Clara Wall, Lavonia Wall, and Sandy Wall, all of Morristown NJ. May the Loving Memories of Elyse remain forever in the hearts of her dear family and friends. To send flowers or a remembrance gift to the family of Elyse Loretta Wall, please visit our Tribute Store. "Email Address" would like to share the life celebration of Elyse Loretta Wall. Click on the "link" to go to share a favorite memory or leave a condolence message for the family.